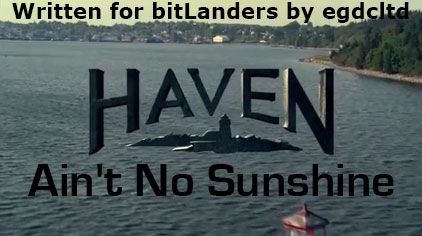 "Ain't No Sunshine" is episode eight of season one of Haven, a supernatural drama series loosely based on Stephen King's novel The Colorado Kid. In this episode people are being killed by a figure whose shadow is the only thing seen. This episode opens at night with what looks like a drunk medical professional staggering home. Then he is viciously attacked. By someone who is invisible, apart from their shadow. Which concludes with him being stabbing by an invisible blade. Nathan seems to be getting on well with Jess (even if he needed a little help) when he gets a call from Parker. Who ribs him about Jess. In turn Nathan ribs her about her lack of friends. The dead man works at a medical centre, one where Jess works sometimes. The Dark Man is Responsible? There is a belief by some families of people who go to the medical centre that the Dark Man is responsible for patient deaths. A shadow could well be a Dark Man. After a patient counselling session run by Jess, the patients who have lost people all blame the Dark Man. That night a woman stabbed in through the chair she is sitting in. Again by the shadowy figure. Parker and Nathan interview the patients who spoke to them. Unfortunately, the only thing their descriptions of the Dark Man have in common is he's dark. A search at the newspaper just brings up a story about a black man moving to Haven. Parker decides to exhume some of the patients who died at the centre, to see if they were killed by knives as well, because autopsies were not carried out on cancer patients. She is being photographed that night when the Dark Man appears. This means that they now know what the Dark Man is, but there's more going on.